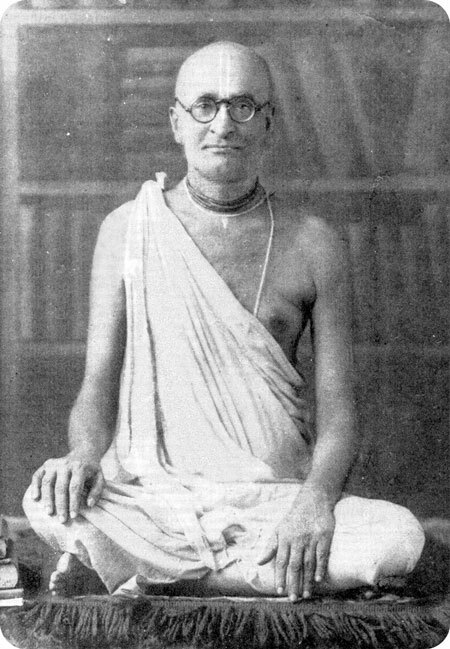 Srila Bhakti Siddhanta Saraswati Goswami Thakur Prabhupad, the disciple of Srila Gaura Kishor Das Babaji Maharaj, is the guru of both Srila Bhakti Raksak Sridhar Maharaj and Srila A.C. Bhakti Vedanta Swami Prabhupad. Srila Bhakti Siddhanta Prabhupad preached that the Gaudiya Math stood for the dignity of the entire human race, by teaching wholesale surrender to the Absolute Good. Especially active in the field of publishing transcendental literature, his erudition was profoundly commanding and elaborate. He revolutionized Krishna conscious preaching by giving preference to pure devotional qualifications over lineage, and it was he who set the precedent of Vaishnav tridanda-sannyas (the renounced order of devotional life) in accordance with the injunctions of the revealed scriptures. To exemplify this sublime ideal, Srila Bhakti Siddhanta established sixty-four Gaudiya Maths in India in the 1930’s, and all through he embraced the line of worship of Lord Chaitanya as nondifferent from Sri Sri Radha and Krishna. Although outwardly he was like a lion, inwardly he was very, very sweet—yet it could be traced only in his internal sweetness. Outwardly, the way of love was worshipped by him with grandeur, awe, and reverence, but his object was the simple and beautiful Divine Love of Vrindavan, and his temperament in establishing that in the world was just like a lion’s. Calculation, the rules and regulations, awe, reverence, all these things are minimized, checked, slackened with the softness of Vrindavan within, and with the hardness of a devastator without, he created havoc in the materialistic world, fighting with one and all. Single-handedly fighting against the whole world, and cutting asunder everything—that was his external attitude. And his second attitude was to put a stop to all scholarly researchers and doctorates of different departments, and to stop their boasting research; and third, to minimize, to slacken the grandeur of the worship of Narayan. He caused the domain of love to descend into this plane with the service of Radha-Govinda, establishing the flow of divine love from the heart as all in all. With that we come to serve our object of worship, and he represented the service of Radha Govinda as the highest attainment. That was his history. The real existence of Srila Bhakti Siddhanta Saraswati Thakur Prabhupad is in bhakti-siddhanta-vani, his divine teachings. May that bhakti-siddhanta-vani dance eternally within the core of your heart.